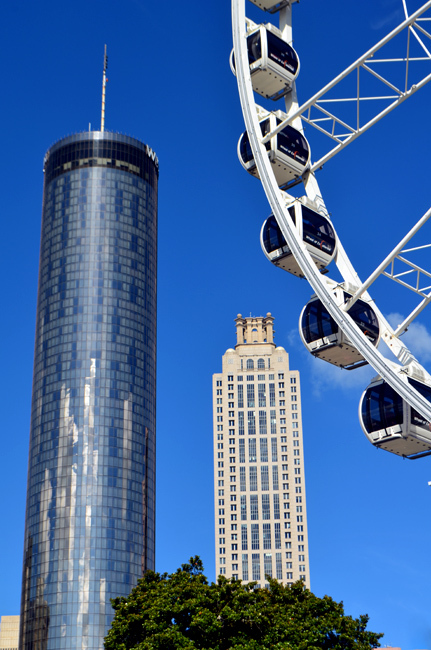 SkyView Atlanta is our newest high-buzz attraction! 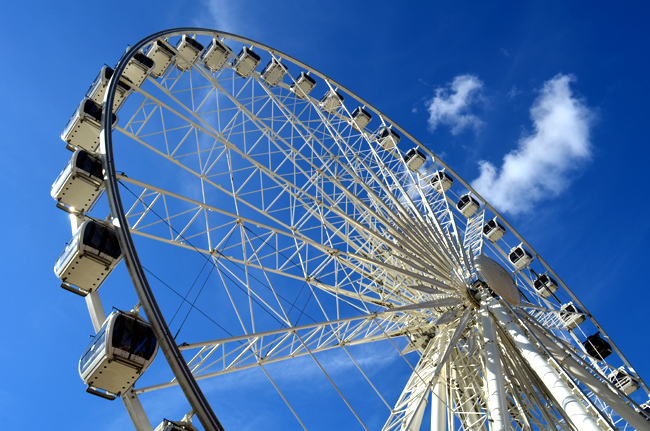 At 200-feet tall—20 stories!—SkyView Atlanta offers a unique perspective of the city that's never before been available...it's a whole new way of seeing our beautiful city, for visitors and locals alike! 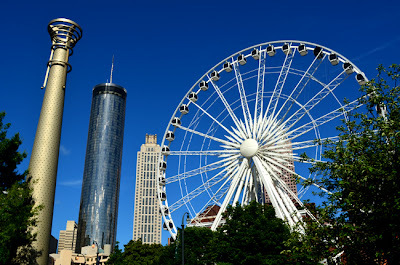 A skyline-changing addition to Atlanta, located in the Fairlie-Poplar Historic District in Downtown Atlanta, the SkyView Ferris wheel brings with it the promise of more to do, more visitors, and an increase in patronage of businesses on that side of Centennial Olympic Park (and there's lots to do near SkyView!). SkyView is right next to The Tabernacle, a one time church turned live entertainment venue, across the Park from CNN Headquarters (CNN Studio Tour), Phillips Arena, and immediately in front of the Fountain of Rings. Each gondola can carry up to six passengers. I'm told that if you have a small group, four or five perhaps, that they'll let you ride without additional passengers...pretty nice of them! And each ride is four revolutions that last approximately 15 minutes total. I'm predicting that SkyView Atlanta will quickly become one of the most photographed attractions in the City. Now being part of our skyline, the backdrops for photographs are practically endless, not to mention the perspectives! On this particular visit, I made photos only from the ground and only from one side. Just wait until I get inside and for when I start taking photos from various rooftops! So, SkyView just opened yesterday so I still have a lot to experience with this attraction, however, I did see on the news that at night, it's illuminated with a rather spectacular light show...that's going to be really cool! 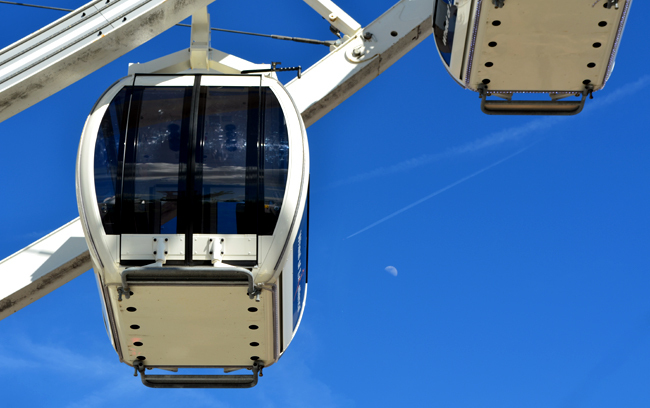 And lots of people will have the opportunity to ride, given it's relatively long open hours. They're open Sunday through Thursday from 10 a.m. to 10 p.m., and on Fridays and Saturdays from 10 a.m. to 11 p.m. Personally, I can hardly wait to ride during sunset! 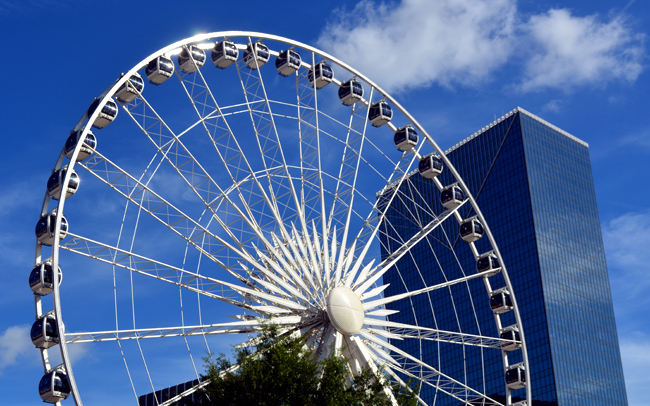 So, get yourself over to SkyView Atlanta, morning, noon, or night...this is going to be a major player in how visitors see Atlanta. I'm very excited for all those who are experiencing it first. And while you're down there, remember that Georgia Aquarium, World of Coca-Cola, Imagine It, and many other tourist destinations are just steps away! Now, head over to the wanderlust ATLANTA Facebook Page where I've posted a few more photos for you to enjoy. 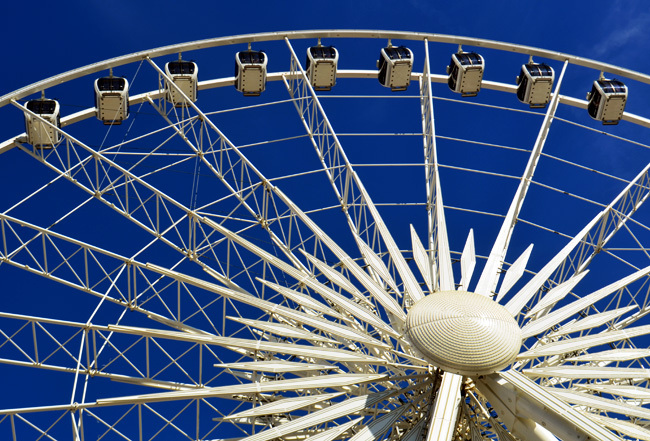 Hope you get to ride Skyview Atlanta soon! It's a beautiful sight. I had no idea. I'm way to scared to ride it. Hope for reports from the top.